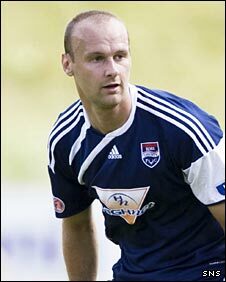 Ross County have signed Faroe Islands international Atli Gregerson but lost fellow central defender Steven Watt. Former Chelsea and Swansea City 25-year-old Watt made 56 appearances for County but missed out on playing in the Scottish Cup final in May. He rejected the offer of a new contract and is seeking another club. Gregerson, 27, previously of Vikingur in his homeland, has won eight caps, playing in recent World Cup qualifiers, and has captained his country. The 6ft 4in defender began his career in Denmark with Randers and Lyngby. County manager Derek Adams told his club's website: "I'm delighted to secure Atli's signature as in addition to the obviously physical presence he has on the park his experience against top international sides is a huge plus - not just the experience of going up against players like Benzema and Anelka in a high pressure game but also working with former Republic of Ireland manager Brian Kerr in training. "We have a relatively young squad, so Atli definitely adds something a wee bit different to the group, which is what you look for as a manager." Meanwhile, County have offered a one-year contract to 24-year-old central defender Chris Innes, who has been released by St Mirren.